Robert Francis Vaughn was born on November 22, 1932, in New York City to show business parents. His father, Walter Vaughn, was a radio actor, and his mother, Marcella Gaudell Vaughn, a stage actress. They divorced when Vaughn was only six months old and he was sent to live with his maternal grandparents in Minnesota. Vaughn had a troubled childhood and would probably have become a delinquent if he hadn't acquired his interest in acting. Fortunately, he was also a good student and athlete, and won a scholarship to attend the University of Minnesota. At 17, after the death of his stepfather and both grandparents within a year, he moved to to live with his mother in Los Angeles and continue his education at Los Angeles City College where he graduated with a degree in theater in 1956. It was during this time he got his first break as an actor. After receiving rave reviews in a local stage production of End of a Man, he won small roles in several movies. But before he could capitalize on the opportunites, he was drafted and spent a year in the Army as a drill instructor. Upon Vaughn's discharge, he continued his acting career. In 1960, he was nominated for an Oscar for his supporting role as a one-armed alcoholic in The Young Philadelphians, the same year he completed his master's degree. More movies followed, including The Magnificent Seven, and many television guest appearances. It was Vaughn's recurring role on The Lieutenant,a short-lived series about the peace-time Marine Corps co-produced by Norman Felton and Gene Roddenberry (who later went on to greater fame as the creator of Star Trek) that caught the attention of Felton and led him to be cast as U.N.C.L.E. 's chief enforcement agent, a role that would change his life. Despite the grueling shooting schedule of a successful working actor, he continued his education, even during the heyday of U.N.C.L.E. He attended classes at night and eventually earned a Ph.D. in 1972 from the University of Southern California. His thesis on show business blacklisting has been published under the name Only Victims. As a liberal Democrat, he was also heavily involved in politics during the run of U.N.C.L.E. On January 29, 1966, in Indianapolis at an FDR-JFK fund-raising dinner, Vaughn became the first member of his profession to publicly oppose United States military involvement in Vietnam. He continued to give many speeches during the period to further his cause and went on William Buckley's show, The Firing Line, to debate Buckley and other members of the Johnson administration. After the series was canceled in 1968, Vaughn took a break from Hollywood and moved to Europe where he continued to act. In 1972, he joined the cast of The Protectors, a 30-minute U.K. action series produced by Gerry Anderson. Unfortunately, the show did not enjoy the same amount of success as The Man From U.N.C.L.E. though it did last two years. Napoleon Solo is in a way a major departure from the characters Robert Vaughn usually plays on screen. Other than The Protectors and of course, The Man From U.N.C.L.E., he has rarely played the romantic lead type. In his pre-U.N.C.L.E. days, he was often cast as the heavy in his many television guest appearances. After the demise of U.N.C.L.E., one of his first roles was playing a glib and politically-motivated district attorney against Steve McQueen in Bullitt where Vaughn clearly demonstrated his ability to play a ruthless villain. Apparently, Hollywood producers has also noticed this. In later years, he has more or less been type-casted in such roles. For instance, in Superman III, a movie that also showcased his comedic talents, he played the evil tycoon in a suit who wanted to kill the Man of Steel. Vaughn continues to be active in television and films. He was last seen on the big screens in BASEketball during the summer of 1998, playing, what else, but an evil tycoon in a suit. He also has a recurring role in The Magnificent Seven, the television remake of the screen classic he appeared in 1962, playing Judge Travis, a character that reminded some fans of what Solo might have been like in later years. He now lives in Connecticut with his wife, Linda Staab, whom he married in 1974. They have a son, Cassidy, and a daughter, Caitlin. On July 27, 1998, Vaughn received a well-deserved star on the Hollywood Walk of Fame. For sentimental reasons, he had requested his star to be located near the corner of Hollywood and Cherokee close to where he and his mother first lived when he moved to Hollywood. 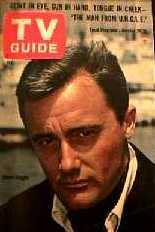 In 1987, Thessaly Press published a book in the U.K. devoted to Robert Vaughn's acting technique. It is available for purchase at Amazon.Com U.K. for 9 British pounds plus shipping. The book is not available at Amazon.Com U.S. but American fans can buy it from the U.K. site. Vaughn's doctoral thesis. The suggested list price is U.S. $17.95 (paperback version). You can buy it at major bookstores or order it from Amazon U.S. or Amazon U.K. as well as many other online booksellers. The award-winning web site designed by Daniel Bolton, a fan in Australia. The site endorsed by Robert Vaughn. Many photos and screenshots from Robert Vaughn's movie and television appearances. TV-NOW provides a monthly schedule for Vaughn's appearances on television. Note, however, that it does not cover local stations. If you want that information also, go to the search engine at TV GUIDE or ClickTV or another online television schedule. Some of these sites may require registration.